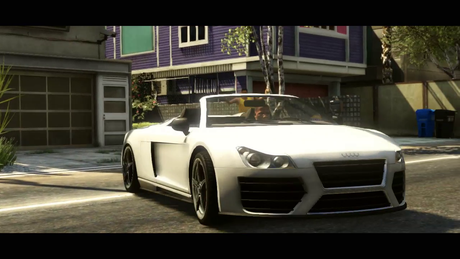 Several cars and other Vehicles can be identified in the debut trailer, though the names of the vehicles are not all known at this time. There is a bicycle propped up against the house with the "For Sale" sign in the garden, which can be seen at 59 seconds. Also there is a Futo in the driveway, which makes a return from GTA IV. At 00:57 we see a black car get air over a jump. This car's real life counterpart is an Audi R8 Spyder. A red convertible drops its top. From the rear, the convertible looks much like an Aston Martin Vantage. From the front, it looks more like a Porsche though appears to have a very Aston Martin-like hood badge. Looks to be based on an M3 and Sentinels in previous GTA games have been just that. A convertible version is also debuting on the title. Outside a liquor shop is a dark-colored car that appears to be an older classic, perhaps Firebird-inspired. The Serrano is a car which already is in GTA 4, in The Ballad of Gay Tony. This car looks like a jeep, and in the background you can see a blue Futo car, this car already exists in GTA 4. Yeah..I may be doing it later on..